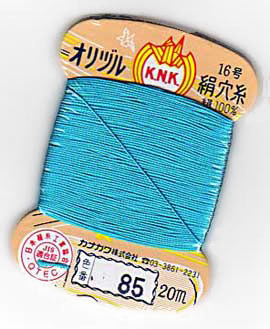 The Kanagawa 1000 denier is a 3 ply twisted continuous filament silk thread of the highest quality. It also known as 1000 denier YLI or KNK 100% pure filament silk thread. Although designed mainly for hand embroidery, needlepoint, and hand stitching for quilting, this silk thread is also great for beading, half-hitching, micro-macrame and cavandoli tapestry knotting. It is a colorfast thread with a super high sheen. Personal note - I love this thread. I ply it into a larger thread for beading and wrapping. I also use it for half hitching in free-form cavandoli and micro-macrame in combination with nylon #18 and C-Lon Bead Cord. It has a lovely feel and sheen. The filaments are sturdy and well plied. It does well with manipulation unlike some other silk. The color range is great, especially now with the addition of the Fujix Tire Silk!